Congestion storybook is used to depict the congestion conditions of each corridor / sub-corridor. The storybook applies interactive style which allows the users to turn page or select page. 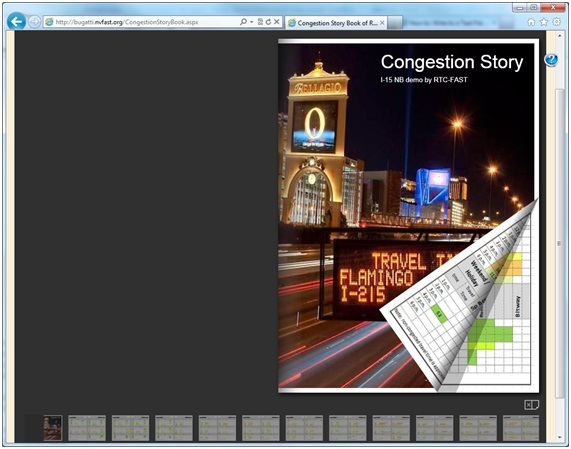 Congestion storybook provides user a quick overview of the current and historical freeway performances. 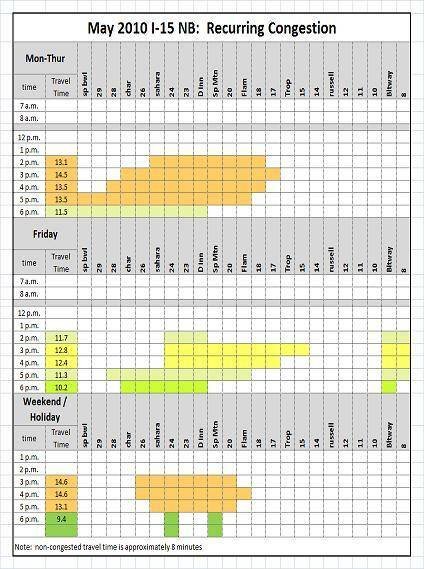 By comparing each month’s congestion page, the impact of construction activities, ramp meter strategy changes, striping modifications, and freeway capacity increase (HOV lanes open) can be easily observed by users and decision makers. 3. Select Page: Click on the under the book, the page thumbnail list will show up on the bottom of the web page; Hover the mouse on the thumbnail page, the page will pop-up; Click will open this page directly on the book. · Currently, Congestion Storybook is still a demo version which only shows the congestions of the urban freeway segments from year 2009 to 2011. 5. The express lane project construction in July and August 2009, adding the 3rd lane of Tropicana ramp meter, partially opening HOV lane to Flamingo, and fully opening HOV lanes can be easily observed from each page by users, professionals, and decision makers. · The congestions shown in this demo are recurring congestion without crash impact.